I saw hype for this book before it was released, and I knew I had to have it. I didn’t get an ARC for it, so once I finally got my summer paycheck this was my first buy. And I’m so glad I actually bought a physical copy of this book! 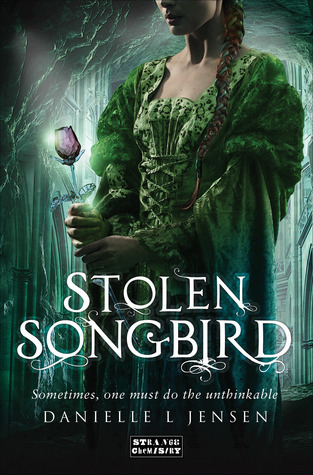 I’m going to preface this review by saying Stolen Songbird is definitely one of my top five favorite reads of the years. I loved this book with every ounce of my being. I didn’t want it to end. I even put of reading the final 100 pages for a few hours because I didn’t want to finish and realize that I would have to wait nearly a year for the second book to come out. The characters and world in this novel is amazing! I’ve never read a book about trolls. Yes, I’ve read of trolls, such as those in Lord of the Rings and books like that, but nothing that pertained specifically to trolls. This provided a really unique spin on this genre, and I loved every moment of it. And for once this is a book that didn’t contain insta-love! But to watch their love grow was a wonderful thing. It was beautiful yet also flawed, and it grew not in attraction (though that was definitely part of it), but it also grew in respect and admiration, which you don’t see very often in YA lit. Cécil (the MC) is a wonderful character in and of herself. She doesn’t necessarily start off as a weak woman, but she grows exponentially throughout the bulk of the novel. Trolls are inhumanly quick and strong and have magic that could crush humans to dust, but by the end of the novel she has a drive and desire to help others that is beautiful! By the end, her strength of character outweighs the physical strength of the trolls. Talk about some fantastic character development. Overall, this is one of my new favorites, and I will forever sing its praises! I can’t wait for the sequel in the series to come out so that I can fall in love with this story all over again! If you enjoy a fantasy read that carries hints of Beauty and the Beast and something so uniquely and wholly its own, Stolen Songbird is definitely for you! I love the cover of that book and the story sounds great! It really is!!! It's a wonderfully refreshing story! I loved this book! And you are so right, it was refreshing to not have an insta-love romance! The romance and the new take on trolls really drew me in. It's one of my top reads for this year too, I can't wait to read the sequel. Great review Amanda! I love the world in this one too! So interesting! I can't wait for the next book!